The Big Picture the goal is to bring down the huge cost of spaceflight, allowing anyone from a curious high school student or basement tinkerer to a professional scientist to explore what has until now been the exclusive realm of governments and large companies. By shrinking the spacecraft, we can fit more into a single launch slot and split the costs many ways. I want to make it easy enough and affordable enough for anyone to explore space. 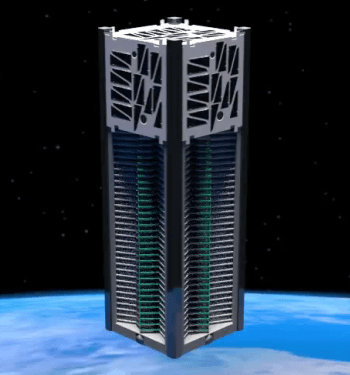 Kicksat is an amateur radio CubeSat technology demonstration mission designed to demonstrate the deployment and operation of prototype Sprite “ChipSats” (femtosatellites) developed at Cornell University by Zac Manchester. ChipSats like the Sprite represent a disruptive new space technology that will both open space access to hobbyists and students and enable new types of science missions. A significant portion of the KickSat mission has been financed by over 300 individual sponsors through the crowd-source funding website Kickstarter. The KickSat beacon radio will transmit telemetry packets with information like battery charge state, temperature, and Sprite deployment status. Packets will be transmitted every 30 seconds when the satellite is powered on and every 250 seconds when it is in charging mode. Standard Ham radio equipment and software can be used to receive and decode the beacon packets. TLE (Preliminary, check calpoly for updates). Will be launched 14-04-2014. Scrubbed due to helium leak in the first stage, new launch Friday 18-04-2014 19:25 UTC. Decayed 2014-05-14 01:36 UTC without being able to launch the Sprites. All of the Sprites transmit on the same frequency. Each Sprite has a unique pair of PRN codes that it encodes its transmissions with, allowing a receiver to tell the Sprites apart (this is known as CDMA). A list of all Sprite PRN codes codes is available online. Due to the low power of the Sprite transmitter, some signal processing tricks are used to ensure that data can be successfully decoded with low gain antennas. The Sprite receiver is written in C++ for the GNURadio framework and is available on GitHub. An automated install script is available here. Decayed. Will be launched 30-04-2014 08:59 UTC. Launched and active. Example: P4C,783,0,0,0, the first three letter code (P4C) indicates that the satellite is in charging mode. The next number is the battery voltage in units of 1/100 volt, so 783 corresponds to a battery voltage of 7.83 volts. The next number (zero) is the number of main flight computer resets (in our case a Nexus S smartphone thanks to the PhoneSat team). The next number is the number of watchdog microcontroller resets. The last number (zero) is a status byte indicating if the ChipSats have been deployed yet. KickSat – Sprites radio information.